The Plexitone is a great pedal for those players that need the boutique sounds found on Marshall Plexi heads plus boost without the hefty price tag of owning one. The build is amazing – really strong metal chassis with “chickenhead” retro style knobs. This pedal is full bypass so it doesn’t degrade your sound when not in use. Another useful extra is that Carl Martin has built the power supply inside the box itself, so you will never forget your adapter last minute before the gig. The downside of this design is that the unit has to be used on US electricity alone and cannot be taken to say Europe while you’re on tour. If your power supply blows up due to a clubs’ power failure (happened to me before) you’re toast. You cannot use batteries due to the fact that this pedal requires higher voltage to run. With these cautions aside I find the benefits outweigh the cons and it is more likely that I’d forget the power supply than blow the pedal so I am happy in regards to the design. The CM Plexitone has a guitar input and output ¼ in. jacks, 5 chickenhead knobs labeled “Boost”, “Level”, “Tone”, “High Gain”, “Crunch” and 3 on/off momentary switches labeled “Boost”, “Select” and “Drive”. To test this unit I used an Ibanez mid-grade guitar ($500) with Seymour Duncan distortion pickup upgrade and a Dean Z with PAF Joe Satriani humbuckers. The amps I tested it with were: Fender Princeton 112 (clean solid state amp), Marshall VS100 head amp, Laney AOR 50 Head (tube) running into a 2x12 speaker loaded with Celestion greenback speakers. To top it all off I also ran it into an H&K Redbox (speaker emulation device). On all tested the CM Plexitone had a very distinct sound to it and one thing that always came through in the sound was “quality”. The pedal has 3 switches – “Drive”, “Select” and “Boost”. 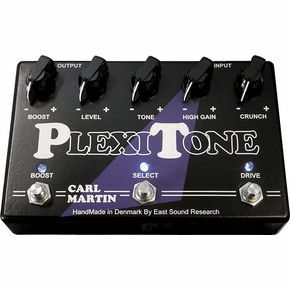 The manual provided with the pedal was too busy boasting Carl Martin’s other products and offered little insight on this pedal, besides showing some presets. It took me a while to figure out why the “Select” button by itself did not change the sound. It turns out “Drive” has to be first on in order for “Select” to work by adding the second distortion section! It would’ve been nicer to at least have a diagram or a simple explanation on how this ting works – I was about to ship the unit for servicing until I remembered the usual operation on the Plexi amp, which required you to hot patch one channel to the other in front of the amplifier itself. So in essence, “Drive” engages the “Crunch” section, which can be described as ranging from bluesy Clapton sounds to AC/DC distortion. By engaging the “Select” button while “Drive” is on, the player engages a second overdrive channel on top of the first one adding yet more gain which brings the sound closer to Van Halen 70s and 80s sounds. The “Tone” control basically changes the tone of the unit and the contour as well. From the left you can dial in a smoother bassier sound with the highs rolled off and as you move towards the right the sound gets grittier and the high frequencies start to become more predominant. The “Boost” pedal engages a signal boost which is very useful for soloing, and the “Level” knob controls the output of the pedal. There are lots of useful sounds to be found on this pedal, by playing with the two OD sections (“Crunch” and “Drive”) and varying the “Tone” control. One thing that I missed on this unit was a dual eq for each channel or at least a bass and high eq control for the whole pedal. Regardless of that omission the pedal sounded great with pretty much anything I threw at it. It kept is character on all amps but sounded best on the solid state units, where it got almost identical to a cranked Plexi. I tried to also run it as OD pedal in front of the tube amp but it didn't work in that capacity . The boost can still be used in the fx loop for your leads so that is an extra bonus if say you needed the Plexi sounds for the studio but also need a boost pedal for another amp. Another setback was the fact that the distortion was voiced on the cold side – basically high gain shredders and back and death dealers need to look elsewhere for their sounds. It was a bit of a disappointment that the unit could do gainier sounds, because it would’ve been great to be able to get a raging shred distortion sound out of this unit, because it is voiced so well. As far as I am concerned, CM could’ve added more gain to the second knob and made the pedal more versatile. As of now it strictly stays in the retro category and it doesn’t deliver higher gain sounds than say Metallica circa “Kill ‘em All”. If you’re looking for a great blues, classic rock or hard rock distortion with the true sound of a Plexi amp – this thing totally delivers. For the money it might seem expensive at first but for around $200 you get CM “Made in Sweden” durability, 2 gain channels and a boost. When you compare it against boost pedals nowadays running at $120 alone this stomp box at its current price is a steal.